ALMA — Johnny’s gone. So is Ed. 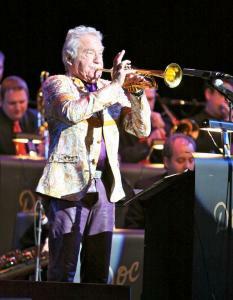 But fans of the popular Tonight Show starring the late Johnny Carson and his sidekick Ed McMahon are still enjoying perhaps the most talented personality on the show, legendary NBC Orchestra leader and trumpeter Doc Severinsen. 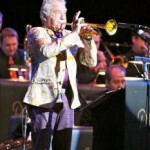 Doc Severinsen and His Big Band played to a full house at the Alma Performing Arts Center Saturday, March 10. With good looks belying his 84 years, the Grammy Awrd-winning Severinsen led his 15-piece band and jazz vocalist Vanessa Thomas through a program of hits including tunes Count Basie and Duke Ellington, as well as Latin-inspired jazz. His slim physique was evident beneath the flashy outfits he’s known for wearing. The local crowd wasn’t stingy with its standing ovations, delivering several for Severinsen and his band and one in particular for Thomas. The program featured every player in the band, many more than once. The band includes Brad Shermock, Mark Bobnick, Adam Rossmiller and Zack Lozier on trumpet; Michael Nelson and Scott Agster on trombone; Dave Budimir on bass trombone; Mike Migliore and Carlos Vega on alto sax; Ernie Watts and Chip McNeill on tenor sax; Clare Church on baritone sax; Stockton Helbing on drums; Kevin Thomas on bass and Mary Louise Knutson on piano.